About a month ago this picture popped up in my facebook newsfeed. It was posted by Occupy Wall St and reposted by a friend, and it went viral, as these things do. 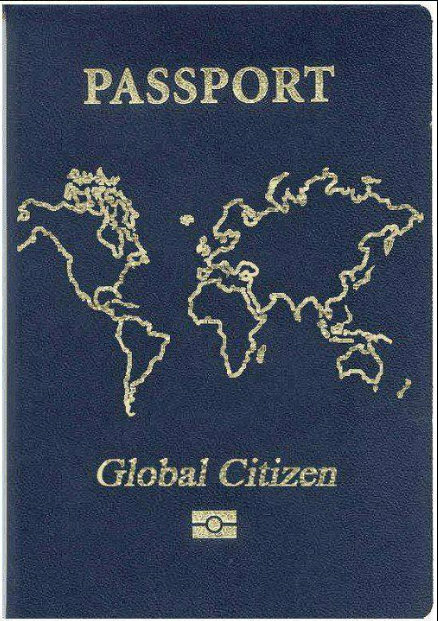 It is, as you can probably see, a draft for a passport for a global citizen, a citizen of the world rather than of any particular state or nation. Now, I do understand what they're trying to say, and I appreciate the effort, but the picture left me thinking. What is actually being said? And what would be the implications? Is it even possible to speak of global citizenship? 'Scuse me, but ethno-centric much? The map used is of the Mercator projection, often criticised for its skewed representation of the sizes of the various landmasses, showing areas far from the Equator - incidentally, the northern half of the globe - as much larger than they actually are, implying that the areas here are more significant than the southern ones (I accept that this was not the original intention of the map, but the continued use of it does make this come to mind). Also, where's Greenland? But I digress. The map represents a continuation of the present world order, with rich (Northern) countries being in power, and the rest following suit. Why not use maps such as the Chinese one or perhaps such as have been made in Australia, showing the South as upwards on the map? That would be breaking with tradition in a rather more radical way. Supposing the passport-maker was just lazy and just took the easiest map, as the map in itself is not so important and just serves as a representation of a point, let me move on to that point. For what does being a citizen, of the world or of anything, actually mean? In Danish we have to words for citizenship; statsborgerskab and medborgerskab. The first denotes the legal aspect – basically, what does it say on your passport? The second term implies living and participating as a citizen of any particular society; doing one's duties as a citizen where one lives, be this through paying one's taxes, driving on the right side of the road, whatever. It is more about feelings and actions, not so much about formal paperwork. Because these two are implied in the same word in English, there is a tendency to conflate them and not separate the implications of each. I suspect this is what is happening here, in this imaginary passport, as shall be argued in a bit. First, a bit about the conception of state, nationhood, and, by implication, citizenship (in the participatory sense). One of the most well-known theorists on nationalism is Benedict Anderson, who tells us about nations as imagined communities – basically, we feel we belong to a state or people not so much in terms of actually knowing these other people, but by sharing ideas with a large group of individuals we will never meet, but with which we feel we belong because we share some idea or other with them (we all pay our taxes together, we all speak the same language.. any given thing, really, but mostly on the level of ideas). Now, please connect this the theory of Fredrik Barth on ethnic groups and boundaries. What Barth tells us is that what matters for defining a(n ethnic) group is not so much what the people in it have in common, but rather what they have that distinguishes them from the other groups in the neighbourhood. The boundary is the point, not the core. This basically means that what makes someone, say, Danish, is not some inherent Danish-ness, but rather that which distinguishes Danish people from others. So, we speak Danish and not Swedish, and we eat this kind of food and not that other kind, and that's what makes us Danish. Being Danish would be meaningless if there were not some Swedes or Germans or whatever against which to contrast it. Back in my bachelor-student days at the dawn of times (sort of), when we were first learning about the brilliant insights of aforementioned Anderson, we were set to a task: keeping in mind that which I have just outlined, would it be possible to unite the entire humanity in one nation or ethnic group? We (my fellow students and I) discussed back and forth, and were all very anthropologisty about it, but even so, we had to agree that the answer is likely no. Unless some alien race comes and threatens all humanity, there would simply be nothing against which to define our commonalities; and even if aliens should come, the uniting of, what, 7 billion people?, on the basis of.. genetic similarities? Somehow just not plausible. But aliens are not expected to pop by any time soon, so discussing with them as the basis is not how I intend to spend my time, even if I thought they would make any difference. Instead, the point I would like to make is the following: if you include the entire humanity in one citizenship, the term becomes meaningless, precisely because it serves to define the differences from someone or something else, and if each and every human is included, there are no differences and no outside against which to measure it. And if you leave someone outside, then it is not pan-human or global. It is thus impossible to envision a global citizenship in any meaningful sense of the term. While Occupy Wall St (whoever is behind this facebook-page) signal such things as global solidarity and participatory citizenship, passports remain a symbol of legal citizenship, which loses its point if it is to be global, as in that case you would possess it simply for being human, and you hardly need a passport to prove that (unless you are a green outer space alien with seven legs and tentacles, but I think we already covered that). This is why I believe they are actually conflating the two very different definitions of citizenship, another reason why their map-slash-point is not really saying anything substantial when you get to the bottom of it. My imagined they are probably not talking about all this human/ethnic identity anyway, but rather about pan-human togetherness and let's all work together and not be divided by artificial boundaries. Don't get me wrong, by all means let's do that. I'm all for removing artificial boundaries and let's all be happy together. But this passport-picture in reality is talking against a particular world order, without actually addressing it in any useful way. Moreover, there's a group of people representing, or maybe rather symbolising, this world order. To put my question a bit simplified, would the 1% also be invited inside this global citizenship? The thought about global citizenship had occured to me, if not in such a simplified manner (*shoulder self-pat). The Anderson/Barth range/scale of thought is probably a good place to start but I think, however, that without their input people could with relative ease reach the conclusion that the sense of coherence between the peoples of our fair and polluted planet, would be rather thin. There is a point, though, that I often find is missing in talks of these kinds of matters, and that concerns the amount of resources (monetary or otherwise natural) that is spent/wasted on upholding these aforementioned arbitrary boundaries, whether they be the EU's trade tariffs or China's mobile 'slave colonies'. It often seems to me that whoever makes decisions of this caliber, would rather spent their money on upholding profitless structures than invest broadly - as in, beyond their own borders (national as commercial or imaginary). Which I think are messed up priorities, though, one should think that the argument to save expenses by lessening waste would land rather softly in the blood-pumping machinery that conservatives call their hearts. With thoughts like these, one could easily suspect oneself of pseudo-liberal tendencies but no matter how I twist and turn the concept in my head, I can't help but see positive outcomes of policies that focus on deconstructing these artificial or arbitrary boundaries - albeit with a certainty of many social pitfalls lurking in the background. But in the grandest of perspectives (allowing myself the arrogance of thinking that I have such) it seems to work out for the better. Even, and surprisingly so, when it is utopian to think that politicians or commercial and industrial magnate decision makers would ever dream of looking beyond the scope of their own financial gain or electorate... no, wait, I meant to write 'financial gain' once more. Which, incidentally, is also why it will have to be a grass root sort of movement that is needed to kickstart a revolutionary dance of that particular kind.